Soursop is also known as gaviola or Mullatha and is dark green in color when it is raw. When it becomes ripe, it is light green in color and becomes slightly soft. It has ridges on the outside, but the inner part is soft, fleshy and juicy. It has medicinal value and is used for treating many diseases like cancer. People suffering from eczema and other such skin problems benefit a lot by using sousop leaves. Mash these leaves and use it as a poultice to treat such problems. Taking the juice of soursop while fasting is said to cure leprosy. If you suffer from skin eruptions, apply fresh leaves of this fruit on the skin. This helps in healing them quickly. Boils can appear on any part of your body and can be painful also. You can place soursop leaves on the affected areas and soon these boils will be healed. Vitamin C and ascorbic acid are found in high amounts in this fruit. These increase the amount of antioxidants in the body, which fight against the free radicals that are responsible for the ageing of the skin, like the appearance of fine lines, wrinkles and pigmentation. As a result, you will get young looking and glowing skin without any blemishes. Soursop leaves are very useful for getting rid of parasites. So, it is great for getting rid of head lice, which can multiply fast and affect your health. 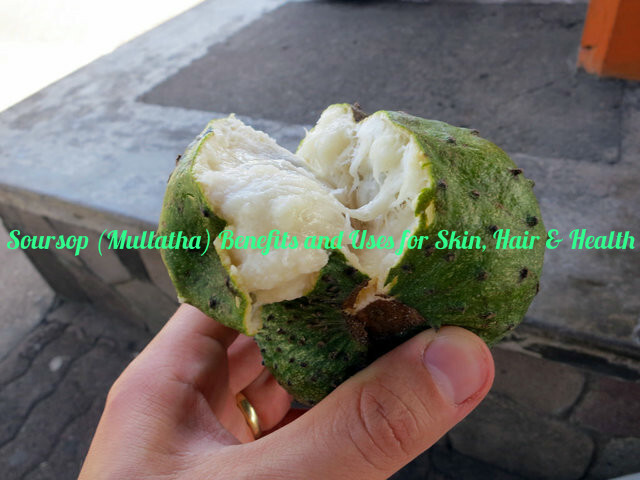 Make a decoction with soursop leaves and apply this on your scalp. Wait for a few minutes and then wash off with water. This way you can get rid of hair lice. About 84% of this fleshy fruit consists of water. This helps in hydrating your body. Hence it is a natural diuretic and helps in the treatment of edema or retention of water. Soursop is a rich source of Vitamin B1, which is very effective for improving your metabolism and to prevent nervous disorders. It is also good for increasing the circulation of blood. Vitamin B2 in it is essential for the production of energy in the body and for the storage of fat in the body. It is also needed for the proper functioning of the nervous system and to maintain the heart muscles. Soursop contains ascorbic acid, which increases the amount of antioxidants in your body. Antioxidants are vital for fighting against the free radicals and thus keeping your body safe from various infections and disorders. Make tea with the leaves of this fruit and have it. This can lower the body temperature and cure fever. Fructose is found in high amounts in soursop. This is a simple sugar and a good source of natural carbohydrates. This can helps in keeping you fresh and regain the lost energy within minutes. It also increases your endurance power as it is rich in Vitamin C.
Presence of various nutrients in soursop like amino acids, calcium, ascorbic acid, iron, phosphorous, carbohydrates, thiamine, riboflavin and fiber make it very effective for killing the parasites inside the body and for the overall development of the body. Soursop leaves are very effective for preventing breast, colon, prostate, lung and pancreatic cancer as it has the ability to kill 12 types of cancer cells. They attack the cancer cells without causing any side effects like nausea, hair loss, weight loss and so on, as you find in the case of chemotherapy. It is also said to be 10000 times more effective than chemotherapy and adriamycin for slowing down the cancer cell growth. Boil 10 old soursop leaves in 3 cup of water till only 1 cup remains. Let the patients have it twice a day for two weeks to get any visible results. These leaves help in killing the abnormal cancer cells and also allow the cells to grow normally. Calcium and phosphorous are found in high amounts in soursop and these are essential for keeping your bones healthy and strong, thus preventing osteoporosis. Soursop can help in inducing sleepiness and relaxation. This is because of the presence of a chemical called tryptophan in it. This fruit is also good for maintaining proper levels of blood pressure and to control hypertension. You can get relief from constipation by having soursop fruit regularly because it is rich in soluble as well as insoluble fiber. Soursop is loaded with Vitamin C, which is a powerful antioxidant. It can improve your endurance and slow down the signs of aging. The leaves of soursop have the ability to get you relief from pain because they have analgesic properties. You can chew these leaves or apply them on wounds to reduce pain and heal the wound. If there is excessive pain, then you can boil 20 leaves of this plant with 5 cups of water till it is reduced to 3 cups. Drink ¾ cup of this concoction once a day and you will get relief. Mash soursop leaves with water and apply this paste on the boils inside your mouth. This helps in reducing the irritation and curing the mouth ulcer. Soursop is high in water contents. So it is very effective for treating Urinary tract infections, hematuria and urethritis. Having the juice of this fruit regularly can treat urethritis, hematuria and liver issues. The high ratio of potassium (278 mg/100 mg) to sodium (14 mg/100 mg) in soursop makes it very effective for people who suffer from hypertension. La foto no muestra ninguna guanábana:parece ser una chirimoya o un anón….Aunque a lo mejor estoy equivocado…..